Last year I made the decision to leave a job that I’d started to hate and start my own business. While at the time it was a terrifying decision and my family still thinks I’m a bit mad, it was definitely the right decision, and I’m finally making money doing something I love. In my case, that’s messing around on the internet! One of the things I immediately noticed when I started going out and using things like professional and networking organisations to build my customer base was how male dominated they were. It’s common to be one of only two or three women in the room and while the people I’ve met – both male and female – have been incredibly helpful and supportive, a lack of diversity in any community is a bad thing. 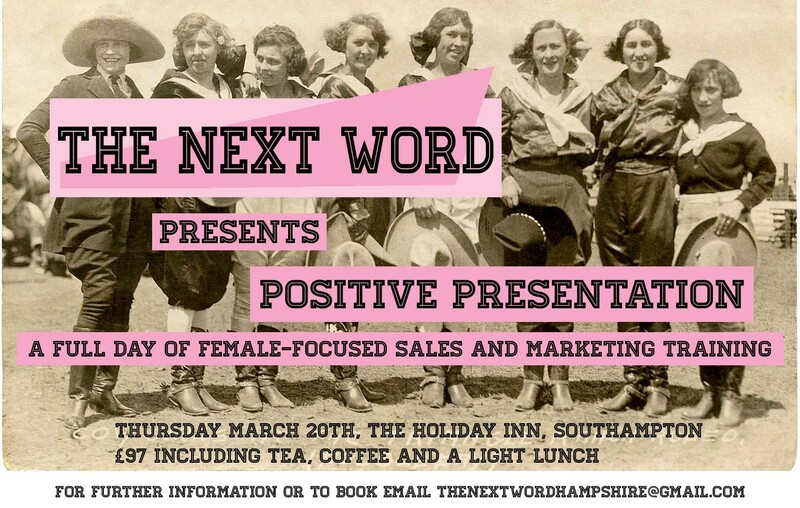 Having talked to other women entrepreneurs in Southampton it turns out that this experience is pretty typical. There are a range of women-only networking groups, where I’ve found the members to be hugely supportive and helpful. In my experience, they’ve been a little more socially focused and I didn’t want to restrict my customer base to only women. A group of us got together and decided there had to be a better way. After talking to local business organisations like the Chamber of Commerce and the Solent Businesss Growth Network, we found that there was a lot of willingness to help women start and grown businesses, but these mostly male groups didn’t feel that they were the best ones to take the lead on the issue. From this, two of us started a project we call The Next Word. Although it’s very early days, we’ve had an amazingly positive response, especially from Southampton City Council, who immediately told us they wanted to support us. Over the next few years, as part of the City Deal and other national and European funding streams, a lot of money is coming into the Southampton area focused on providing training, starting businesses and increasing employment. However, without access to the mainstream community, many women who run their own business are totally unaware of the kind of help, both financial and practical, which they’re entitled to. In fact, there’s a European funded project to build a network of French and British women entrepreneurs, B-NEW, being piloted in Hampshire right now. And yet they’ve struggled to find women to participate! As a group, The Next Word wants to provide training, support, mentoring and networking to help women start and grow businesses. Many women we spoke to told us that having the confidence to approach large and mostly male organisations was a hurdle that they had to actively work to overcome. They also told us that much of the business training that was available was focused on skills that were perceived as traditionally male, and geared towards persuading women that they had to imitate these gendered behaviours in order to be successful in business. This was particularly the case in sales training, where we found women being told to “try and be one of the boys”. Our first steps will be small: we’re running a one-day sales and marketing workshop (details on the flyer below), focusing on building the confidence to present yourself and your products to everyone. From there, we’ll be meeting with the council to discuss other projects and how we can make sure that any women who wants to start a business is able to. If anyone would like more information on The Next Word, they are on Facebook, Twitter @tnw_hants and they too have a blog. If you’d like to attend the workshop later this month, tickets are available online.